After a lengthy absence, stranded in the French countryside “sans internet” I’m back! Back in the land of unlimited (well almost) wifi, data packages and reality TV. So there’s no excuse for not blogging and I have a bunch of posts saved up and ready to share with you… That is if I can stay away from the TV and my shameful, morbid obsession with reality TV. I also have an obsession with the chemicals and toxins that surround us all and ways to keep them out of my body and environment. 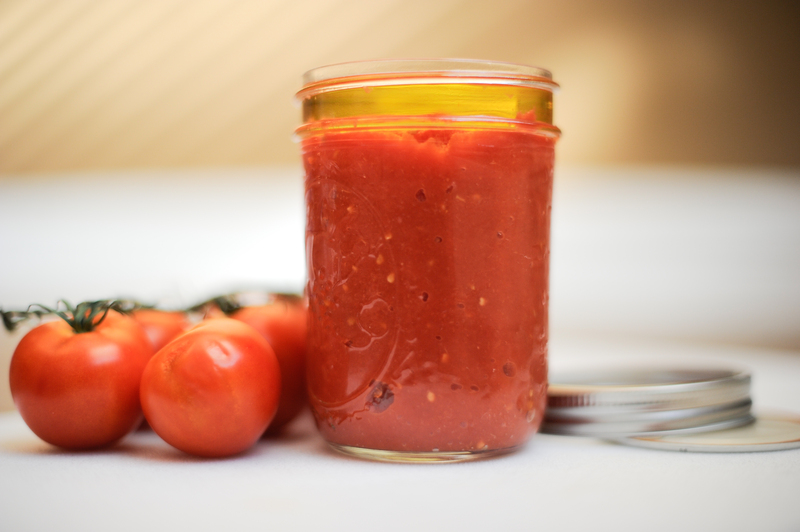 Did you know that commercially canned tomato paste is one of the most toxic canned goods you can buy? Making your own at home packs a big punch in cleansing your diet and stocking your fridge with a high-quality, superior product for all your cooking endeavors. I made pizza last night (homemade dough, of course) and used my homemade tomato paste mixed with a little basil and oregano and the flavour can’t be beat. The difference in taste is amazing and the paste has hundreds of uses – try spreading a little on a piece of bread, for starters. Yields 8 ounces. The small yield of this recipe compared to the lengthy process means you’re probably going to want to quadruple it – it will keep in sterilized jars in the refrigerator for a long time (one recipe I read said the paste will keep for a year, but I’ll get back to you after I’ve tested this myself). The tomatoes you start with directly determine the quality of the paste, so look for vine-ripened tomatoes that are so ripe they’re about to burst. Varieties to try include Roma or Early Girl. Start by bringing a large pot of water to the boil. Submerge the tomatoes in the boiling water for about 3 minutes, or until their skins start to break. Blanching the tomatoes like this loosens the skins and will make them easier to peel. 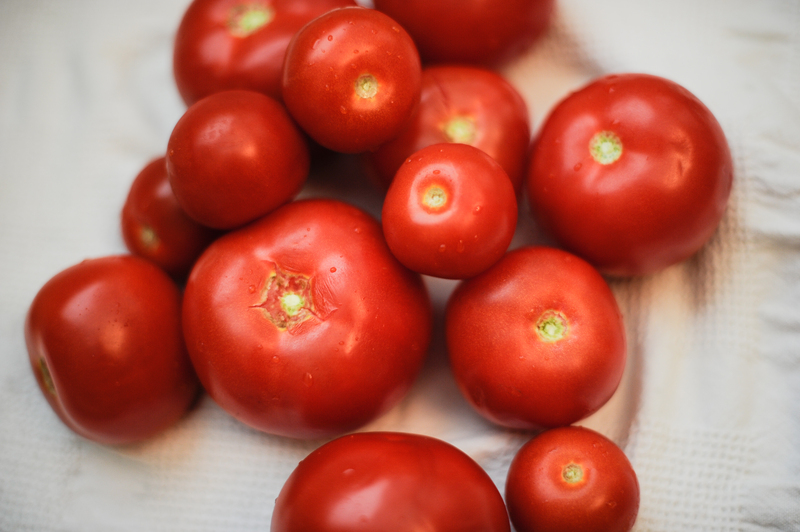 Remove the tomatoes from the boiling water and submerge in an ice bath (large bowl filled with some ice and some water) to cool them quickly. Once cooled, peel off the skins. If you’re having trouble, make a cross on the bottom of the tomato and grab the corners to peel. 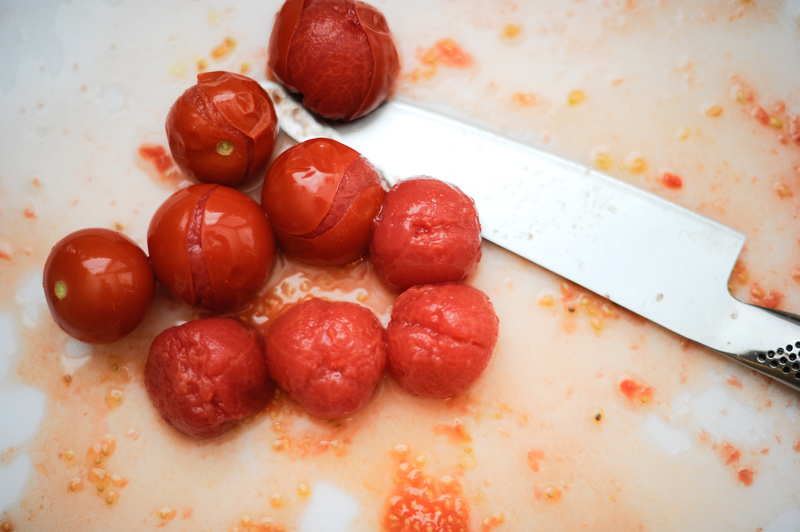 Then slice the tomatoes into quarters and scrape out the seeds, either with your hands or with the help of a spoon. Now process all that tomato flesh in a food processor or blender, then transfer to a pot and boil for 5 minutes (you can skip this step if you can’t be bothered – it’s there to intensify the tomato flavor a little, but it’s not essential). Place mixture in a piece of cheesecloth set inside a colander and let drain in the refrigerator for 12 hours. Now that the excess water has drained out of the tomato mixture, pour it into a shallow baking dish, stir in salt, and then bake at 200ºF/95ºc for an hour. Once cooled, spoon into sterilized glass jars and top with ¼ inch of olive oil and store in the refrigerator. *Take care to pack the paste into the jars tightly and get out as many air bubbles as you can. Tags: blanching, canned tomato, canning, chemicals, cup olive oil, food, homemade tomato paste, jars, olive oil, pasta, pizza, tomato paste, tomato sauce, tomato spread, tomatoes, toxins, vegetarian, vine-ripened. Bookmark the permalink. Whoops. NOW I know how to make tomato paste! I am glad you are out of this “French fairytale life” and back to America! 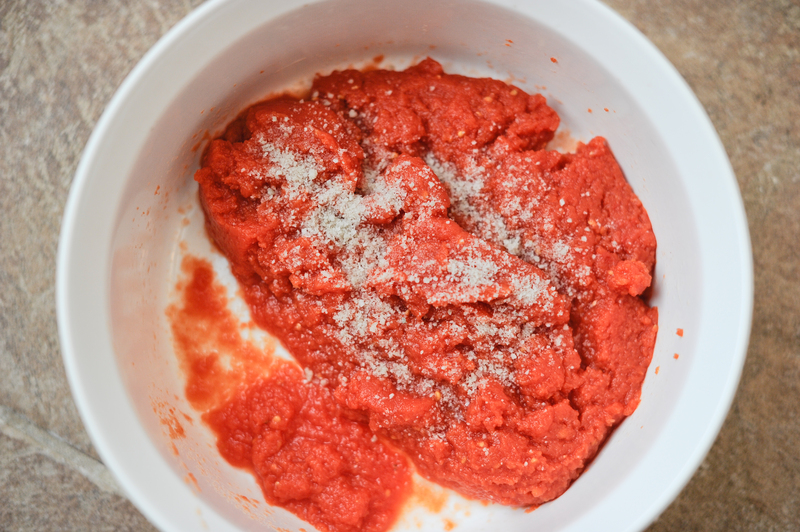 I was delighted to get your recent post on the making of tomato paste and the timing was uncanny – I had just made home made spaghetti for my family and used canned tomatoes and paste. (Feeling awful now….thanks). When I shop, I stay to the periphery of the super market as much as possible…but sometimes you just have to go down those aisles. Can you shed a little more light on to why can goods are so toxic? Organic too? So ANYTHING that comes in a can will have a chemical called BPA (Bisphenol A) leached into it as it sits in the can. BPA is used to line the inside of the cans, but two manufacturers, Eden Foods and Trader Joe’s are now removing it from SOME of their cans, so make sure to check. BPA has been associated with disrupted puberty, liver problems, reproductive problems, cancer, etc.. Tomato paste is particularly bad because it is highly acidic and the acid leaches chemicals out of the can lining very quickly. Buying organic canned tomato paste will not affect the levels of BPAs leached into the cans. However, if you’re still not quite ready to make your own, look for BPA-free cans (mentioned above) or opt for glass containers. As an aside, nearly anything I would have bought in a can could be purchased in a pretty glass jar for half the price in France. Vive la France! This sounds absolutely marvelous……….BUT what alot of work. Hi Grandma, It is a lot of work but similar to when you make your jams and chutneys, so maybe just plan to do it at the same time?